We’re not planning on having another child, but if we change our minds it won’t be before 2 more years as I don’t want 2 in nappies at the same time. So I’m selling my baby things now because I don’t have room to store things we probably don’t need. If we change our minds I will just buy the few essential things we need. At least now we know what to buy, and what not to buy! There are lots of pages on the net that list the ‘essential baby items’ you need as new parents. On all the ones I saw they always listed many more items than you actually need, it’s almost as if these sites are sponsored by these products and just want you to buy extra stuff! Having a baby is worse than a wedding in this way, they see you coming and try and sell you all sorts of junk you do not need. I want to list here the things we think we do need, just in case we change our minds about another baby. This of course is a no brainer, they say they won’t let you leave the hospital without one in your car. Although no one checked our car when we left the hospital with our son! The question is, do you get a convertible or one with a detachable baby carrier? We got a convertible so it will last us for 4 years, these things are pretty expensive! The detachable baby carrier would be really nice but you can only use it for about 6 months so its very expensive, although you can hire them for a lot cheaper. 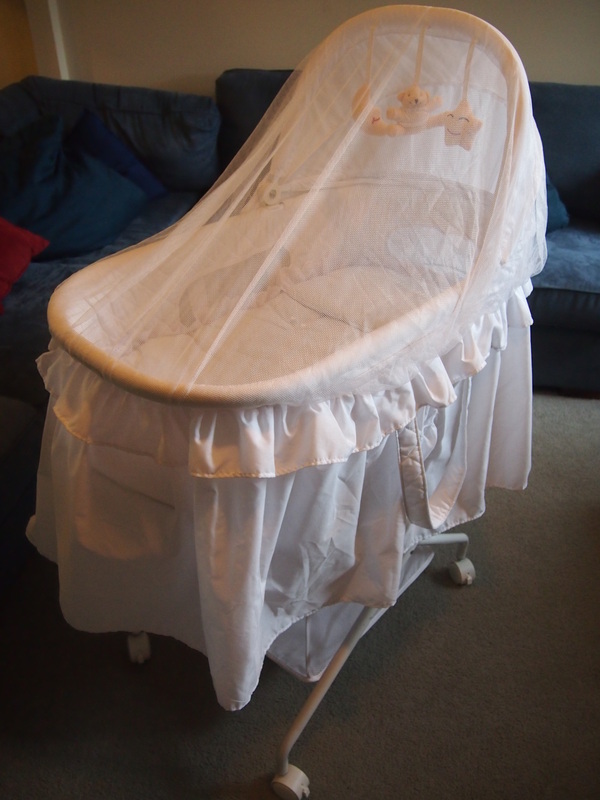 I just loved my love n care bassinet (sorry for the free advertising there). I got white so it’s nice for both a baby boy or girl. It had wheels so I could move it easily around the house as I needed, you can also detach the bassinet from the stand which I rarely did as I didn’t want to wake the sleeping baby while I did it. You only use this for a few months though, until they can sit up or roll over. Our son was premmie, so we got to use ours for a few extra months than usual. It makes it so much easier to put your baby down and pick him up, if he is in a little bassinet. If I have to buy another one, I’ll just get it second hand from ebay. Again we got white, which is good for a boy or girl, we got the 3 way kind which can not only be used as a toddler bed, but also as a little sofa. We will get years use out of this cot even if we only have the one child. You don’t need a high chair until they are 6 months old, but I must remember the next one we buy has to have wheels! If we have to buy another one, it will be a good one as you use this for quite a while. I’m always moving Thomas around in his high chair, but the one we have now is a cheap plastic one from Big W without wheels, so I have to lift it to move him around. Also this one is not easy to clean even though it said it would be, but I think all high chairs are probably hard to clean. A baby eating is a very messy affair! I had a romantic vision of carrying my baby around in a sling all the time, so we bought 3 slings. We weren’t sure we even needed a pram and waited until after he arrived to see. But our son was premmie and too tiny for the slings as it turned out. I still remember the relief I felt the day we finally bought a pram and were able to go shopping without carrying him around. We got a wonderful reversible pram where you can choose to have your baby rear facing or front facing. We had him rear facing for most of the first 12 months, it was so nice to be able to see him sleeping happily in it while we had some time out at the shops. I practised folding it up and putting it up many, many times in the shop before we left so I was sure I could do it. It’s not too big to be too clumsy, just big enough to do the job. The only difference I would make would be to have more room underneath for my bags, and a drink holder in the handle. I was lucky enough to borrow an old fashioned, wooden rocking chair from a neighbour. This turned out to be a god send as it was the only thing that would help my baby to sleep for many months. Surprisingly, I found you don’t need one with padding, so you can rule out the expensive upholstered breastfeeding chairs with stools. I was rarely in the chair for very long, as my baby nodded off so quickly, it worked so well. An old, second hand one would work just fine. I resisted buying one of these for a lot longer than I should have, using a simple bag crammed full of the stuff you need to carry around with you when you have a baby. I thought they were unnessecary. Reality taught me that this is a very handy thing to have, and I love the cheap one I picked up from K-Mart. It has a little change mat that folds out, but I have only used that once or twice. It has compartments that make finding things easier, so a similar bag would be fine, just a one compartment bag was not good enough. Also, it has a good handle with extra padding which is important because it can get heavy and sometimes you are carrying it, but thankfully not too often. Thankfully these things have been borrowed, and were useful when we had to do the obligatory visiting rounds of the extended family at Christmas. The portacot is also now getting used in the office as an extra playpen. I can pop him in there if I don’t want him crawling around in the pc wires. This has also been borrowed, and is useful pulled apart and set up in different places in the loungeroom to keep Mr Crawler away from the TV. Also, we use it to close off the loungeroom area when I don’t want him in the kitchen. We are just using these now as my son is big enough to crawl around and explore the whole house. These are especially important because we live in a townhouse with stairs, so we have them set up to stop him from escaping up them without us being right there. And I’ll tell you what you don’t need, you don’t need a change table, nor expensive matching furniture. I just use a $20 plastic change mat on top of what will become Tom’s study desk. We’re keeping one sling for when we go to the markets which is a place you do not want to take a pram, despite some people insisting on it. The other two slings I’m trying to sell as we’ve never used them. You don’t need fancy baby shelves or baby drawers and you certainly don’t need to paint your nursery! How ridiculous is that, painting a room especially for a baby. Paint your walls off-white once a decade or two, save your time and money, and it goes with everything! I bought some small and cheap $2 baskets to keep his clothes in, which I can move around to his change table, laundry and some old shelves I have in his room. I also keep some toys in these baskets as I got half a dozen and they’ve been really handy. A bouncinette was handy, but only usable for a few short months. When he flipped it over it was time to put it away. And when they can’t crawl you can just put them on the floor. I don’t think we really needed the play mats either, certainly not two, you can just use any rug or pillow. Although the a-frame was used for several months before he could crawl so maybe another one of those would be good. We were given so many clothes, it was unbelievable, we didn’t buy any clothes for months and months, and when we finally did we didn’t really need to, we just wanted to. And the same was for toys. Whenever possible I choose unisex colours, so the clothes and toys can be recycled for any baby. I think that’s much better for the environment, it increases the chance of things getting used by another baby. Maybe it will be ours!